Ichabod Crane Service is a family owned small business based in Big Pine Key, Florida since 1998. 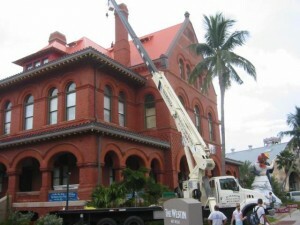 Our fleet consists of a 28 Ton National Boom Truck Crane and a 40 Ton Terex Truck Crane. Ichabod Crane Service’s philosophy is oriented toward customer satisfaction with affirmative control and minimization of risks. The success of each job depends upon the safety of our performance. We have an impeccable record of safety and are 100% accident-free. Our equipment is well maintained and our operators are educated in the capacity and safety of each crane. Our company and operators are all certified through the Department of Defense for RapidGate entry onto military installations, including all three Navy properties in Key West. We are a 100% Certified Drug-Free Work Force following federal guidelines for pre-employment and random testing of all employees. Ichabod Crane Service operators are highly skilled professionals who receive continuous training on their equipment, and in all facets of the crane industry. Our operators are Nationally Certified under the standards set by the National Commission for the Certification of Crane Operators (NCCCO). We also have certified riggers and crane signal persons available to meet your needs. Ichabod Crane Service is committed to providing our customers with the best possible service available.